EVANSVILLE, Ind. – Three matches over the next two days are coming up for the University of Evansville women’s tennis team. On Friday, the Purple Aces head to Louisville for a 4 p.m. ET match before coming back home on Saturday for a pair of home matches at Wesselman Park. Home play features a match against Wright State at 1 p.m. before UE faces IUPUI at 4:30 p.m.
Over its last seven contests, the Purple Aces are 5-2 as they had a great run on their spring trip to Orlando. Evansville picked up victories over Florida A&M, Marian, Creighton, Norfolk State and South Dakota on their way to five triumphs in a row. Diana Tkachenko stands at 13-3 in singles play and is a 2-time Missouri Valley Conference Women’s Tennis Athlete of the Week. Andrea Pascual-Larrinaga has also been stellar, picking up nine victories while Daria Pentsova checks in with eight. Louisville comes into Friday’s tilt with a 9-2 mark and are winners of three out of four. Over that span, the Cardinals have defeated Pittsburgh, Marshall and Miami (Ohio) with the loss coming to Notre Dame. Saturday’s opponents will be Wright State and IUPUI. The Raiders come to Evansville with a 7-7 mark and have picked up wins in their last two outings over Niagara and St. Bonaventure. IUPUI is 2-11 on the season, falling to Indiana University by a 7-0 final last time out. Students of all levels of Spanish are invited to meet with Belén Alemán Mansilla, a Fulbright FLTA, to play some games while practicing Spanish. The next Charlas session is today from 4:30-5:30 p.m. at Jazzman's in Ridgway University Center. It’s a wonderful opportunity to interact informally in Spanish and to meet other students of Spanish. You can stay as little or as long as you want. Please contact Belén at ma360@evansville.edu if you have any questions. ¡Allá nos vemos! Everyone has different talents to bring to the table. Join us for Lunch and Lead today at 12:30 p.m. in Eykamp Hall, Room 252, Ridgway University Center, to learn how to use your strengths to become a better leader. This Lunch and Lead will be presented by Emily Fiedler from the Office of Career Development. This event is free and open to all students, faculty, staff, and UE community members. We encourage attendees to bring their lunch with them to these events. University Worship this Sunday at 11:00 a.m.
All are welcome at Neu Chapel for University Worship this Sunday at 11:00 a.m.
Sign up for UE Gives Back – Saturday, April 8! Join us for our annual Spring Day of Service coming up on Saturday, April 8. We have tons of agencies across Evansville area that need your help! Sign up yourself or your group on UE’s volunteer web page. Let's have a great turnout for our annual day of service! The University of Evansville Department of Theatre opened The Ruby Sunrise by Rinne Groff on March 17. The last performance is tonight at 7:30 p.m.
Out of a remote 1920’s Indiana town emerges Ruby, a driven and capable woman who wants to change the world with the first all-electric television system. Groff’s inventive play follows two generations of strong-willed, Midwestern women working to overcome obstacles that challenge them from moving forward. In this underdog story, conflicts arise and tensions flare as the truth is questioned. Tune into this illuminating tale sure to leave audiences wondering how much is compromised when art imitates life. Elisa Hoover, a senior theatre studies major from Atlanta, Georgia, takes the helm as director of the production. The cast includes senior Cody Vann, from Denton, Texas, and juniors Braden Wilkerson from Fort Worth, Texas., Miranda Schieving from Denver, Colorado; Paige Ward from, Round Rock, Texas, Aaron Gonner from Dubuque, Iowa; Simon Earle from Shorewood, Wisconsin; and Kira Vuolo from Westminster, Colorado. The creative team for The Ruby Sunrise includes scenic design by junior Jacob Sellers from Fort Branch, Indiana; costume design by senior Olivia Rigdon from Colorado Springs, Colorado; lighting design by junior Baxter Pitt from McKinney, Texas; and sound design by senior Robbie Love from St. Louis, Missouri. The dramaturg is senior Emily Westing, from Grand Rapids, Michigan, and the stage manager is junior Emma Blevins from San Antonio, Texas. This production is under the technical direction of Department of Theatre professor Chuck Meacham. Tickets are $11 for adults and $9 for senior adults, students, and UE faculty and staff. UE students may pick up their free student rush ticket beginning at noon on the day of the performance they wish to attend. Seating is limited and patrons are encouraged to make reservations by calling 812-488–2031, Monday-Friday, noon-5:00 p.m.
Have questions about tuition remission and tuition exchange? The Offices of Admission, Financial Aid, and Academic Affairs invite employees to attend an informational session that will provide further details about use of the benefit on Monday, March 27, at 2:30 p.m., in Room 126 in Hyde Hall. Lisa Nikolidakis, assistant professor of creative writing, will give a talk and engage in a lengthy Q&A with creative writing students on the job searches they face as graduation looms. Topics covered might include useful websites for writing and editing job searches, marketing one's strengths, writing those elusive cover letters, and the joys and perils of relocation. The talk will be held in Room 71 in the Schroeder School of Business Building on Friday, March 17, at 4:00 p.m.
Comedian Gibran Saleem appearing tonight! SAB will be sponsoring comedian Gibran Saleem TONIGHT - Friday, March 17 - at 9:00 p.m. in Café Court. Drinks and popcorn will be available, and entrance is free! Did you start the spring semester vowing to be better organized, avoid procrastination, and earn higher grades with lower stress? Could you use a jump-start to get back on track after spring break? Attend one of our Student Success Workshops on Tuesday, March 21, in Grabill Lounge (located in the basement of Neu Chapel) at noon OR at 4:00 p.m.
We will review techniques to assist you with organization, staying focused, and studying effectively. Please e-mail Angie Dawson at ad5@evansville.edu or Stacey Shanks at ss581@evansville.edu if you have questions or would like to request a reminder text or email about the workshops. An exhibit of the work of digital painters Jenna Citrus, Jan Frick Thompson, and Heather Landry is set for April 1-May 6 in the Krannert Gallery. A reception will take place April 20 at 5:30 p.m. These events are free and open to the public. Citrus, a graduate of University of Southern Indiana, has been awarded an Efroymson Bridge Year Fellowship. She has received several awards for her work, including First Place in Photography at the Evansville Museum and Best of Show in the Brescia College Best of Graphic Design Show. Her work has been published in Brainchild Magazine of Kent State University, Fishhook of University of Southern Indiana, and Photographer’s Forum, Best of Photography. 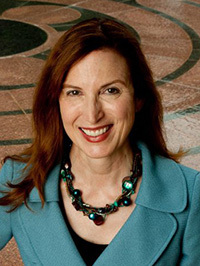 Thompson earned her BFA in advertising from Texas Woman’s University. Her work has been included in the North Carolina Photographers Annual Exhibition, and she has received awards of recognition in the Fayetteville Arts Council Annual Juried Art Exhibitions and the Fayetteville Museum of Art Annual Competitions. Thompson has also shown her work in the Arts Council of Southwestern Indiana exhibitions. Landry is a professional graphic artist with a prolific body of independent work, including several ongoing comic series. Her work has appeared in many local solo and group shows. For more information, contact 207-650-6073. The second annual R. Wayne Perkins Theology Lecture is Monday, April 3, at 7:00 p.m. in Neu Chapel. The event is free and open to the public, but those planning to attend are asked to register online on religious life’s R. Wayne Perkins Theology Lecture Series web page. Clergy are invited to preaching workshops with McKenzie on Tuesday, April 4. The $50 registration fee for the workshops includes lunch and continuing education credits from the General Board of Higher Education and Ministry. Clergy planning to attend the workshops are asked to register online on religious life’s R. Wayne Perkins Theology Lecture Series web page. The annual Perkins Theology Lectures, sponsored by UE’s Office of Religious Life, bring together religion scholars and church leaders to explore perennial theological questions about God and human flourishing. The lectures are intended to be public in nature: both furthering theological understanding and using theological insights to illuminate and interpret important features of our contemporary common life. These lectures are made possible by the generosity of private donors and the Lilly Endowment, Inc., and are designed to generate and foster sustained theological reflection among UE students and alumni, clergy, and the larger community. Rev. R. Wayne Perkins, professor emeritus of religion and ordained elder in the United Methodist Church, came to UE in 1966 as a faculty member in the Department of Philosophy and Religion. During his tenure at UE, he served as director of religious life, University chaplain, and chair of the department. Perkins was professor and mentor to thousands of UE students for over five decades. He advised countless students in their academic achievements and directed students in their ministry and vocational goals. The annual R. Wayne Perkins Theology Lecture Series acknowledges his teaching and advising legacy, and honors his contribution to scholarship, the University of Evansville, the United Methodist Church, and the lives of students for over 50 years. Honors Night: A Conversation with Maggie Stevenson and Katie Aldred is planned for today - Monday, March 20 - from 5:00-6:30 p.m. in the lobby of Powell Hall. Drop in or stay the whole time, we welcome all levels of participation! Light hors d’oeuvres and drinks will be provided. This is a new series where you get a chance to meet and converse with various faculty members from across campus in a more casual atmosphere. Bring your questions and curiosity and learn about your faculty member’s personal and professional journeys. The History Department welcomes you to attend its annual Spring Lecture today - March 30 - at 4:00 p.m. in the Vectren Lecture Hall, Room 100, Koch Center for Engineering and Science. William (Bill) Bartelt, a native of Holland, Indiana, will be discussing his lecture topic "Robert Dale Owen: The Political Transformation of a Wordsmith." Bartelt is a graduate of Indiana State University and the University of Evansville. He taught social studies at Evansville’s Harrison High School for 37 years and was the social studies and fine arts department chair at the school when he retired in 2005. For over 15 summers he was employed as a ranger and historian at Lincoln Boyhood National Memorial [two summers at Lincoln Home in Springfield]. From 1986 to 2007 he was an adjunct American history instructor at the University of Southern Indiana. He is currently president of the Evansville Museum Board, a trustee of the Indiana Historical Society, secretary of the Indiana Library and Historical Board, a director of the Abraham Lincoln Association, a member of the Friends of the Lincoln Collection of Indiana board of directors, and historian (and lay leader) of Trinity UMC in Evansville. He has served as president of the Vanderburgh County Historical Society, as past president of the Southwestern Indiana Historical Society, and past president of the Newburgh Museum Foundation. In 2003 he received the Indiana Historical Society’s Hoosier Historian Award for contribution to historical scholarship. He was a member of the Federal Abraham Lincoln Bicentennial Commission’s Advisory and Education Committees and served as vice-chair of the Indiana Abraham Lincoln Bicentennial Commission. In 2008 the Indiana Historical Society Press published his book There I Grew Up: Remembering Abraham Lincoln’s Indiana Youth. Interested in law school? New legal studies minor is for you! If you’re interested in law school or a job in the legal professions, UE’s new legal studies minor is for you! Students planning to enter the legal profession are advised to pursue baccalaureate degrees in academic areas best suited to their interests. While the new legal studies minor complements the above majors well, it can be paired with any existing major. The minor requires Law and Society (LS125) and Constitutional Law -- both providing necessary context and background for any of the legal professions - plus a variety of electives for more specific law-oriented courses such as business law, criminal law, or environmental law. LS125: Law in Society is offered in Fall 2017. Add it to your registration list! The minor brings together a number of law-oriented courses currently being taught at UE across disciplines and colleges. Contact Kevin Gray, legal studies program director, at kg70@evansville.edu for more information. Catertrax, UE Catering website, is experiencing system issues. Please confirm and make changes to your catering order by phone 812-488-2065 or e-mail catering@evansville.edu. The Office of Publications has distributed letterhead and envelope ordering information. If your department uses letterhead or envelopes during the fiscal year, this is the time to order it. We are able to get a substantial price break on boxes of envelopes (500 quantity) and reams of letterhead (500 quantity) due to the size of the order. Smaller orders placed later in the year will be more expensive. If you did not receive the ordering information from the Office of Publications, please e-mail publications@evansville.edu or call ext. 2561. Orders are due April 12.
International House (I-House) is a long-standing UE program that showcases the University’s international students through weekly country presentations. I-House coordinators are paid to recruit presenters and run the program each Wednesday. Coordinator applications are now available! If you're interested in getting to know more international students and looking for a leadership position on campus, apply today by filling out the I-House coordinator application. Applications are due Friday, March 24 at 5:00 p.m. This is a reminder to all faculty members and departments that textbook adoptions for the summer sessions and Fall 2017 term are due in the UE Bookstore by March 30. This will insure that adequate time is available to set up Buyback and also source textbooks for used copies. Both of these help save students money. If you have questions please contact Brooksie in the UE Bookstore at ext. 2679. Are you interested in taking a non-majors biology course with a lab this summer to fulfill one of your scientific literacy general education requirements? Then take BIOL 100 D01 – Fundamentals of Biology during Summer I (May 15-June 16). Please contact Dale Edwards (de3@evansville.edu) for more details. Would one class that fulfills many general education requirements and teaches valuable skills interest you? How would you like to take such a course NO MATTER where you plan to be this summer? Do you want to reduce your course load during the regular fall or spring semesters? Would you like to be more prepared for your future career in a diverse society and global world? Want to add another skill set to distinguish you from the pack? How about increasing your cultural knowledge and communication competency to relate more effectively with people from other cultures in your personal and professional life? Do you want to fulfill several General Education competency requirements in one course? If you answered yes to any of these questions, you should consider enrolling in COMM 380 ONLINE (Intercultural Communication) offered in Summer Session I.
COMM 380 meets criteria for General Education Outcome 9 (Understanding of Core Concepts of Society, Human Behavior, and Civic Knowledge) and Overlay Component A (Global Diversity: International Component). For more information contact professor emeritus of communication Dean Thomlison at dt4@evansville.edu. As part of Recyclemania, a contest will be held to see which residence hall is recycling the most (by weight) per resident. The contest will be held starting March 13 until 2:00 p.m. on March 31. • Eligible recyclables are paper, newspapers, magazines, empty plastic containers, empty aluminum and steel cans, empty cardboard, empty cereal, soda boxes. • Items not considered recyclable: glass, pizza boxes and plastics other than those marked with the recycle sign and number 1–7. • If a recyclables bag is contaminated with items such as trash, Styrofoam, full drink containers or food, it will be treated as trash, and excluded. • The winning hall will be the one with the greatest recyclables weight per resident. • Prizes – a trophy will be awarded to the winning hall. There will also be a drawing for residents of that hall for two Smart Strip Energy Saving Surge Protectors. Please e-mail js652@evansville.edu or call ext. 2697 for more information. Just a reminder that summer and fall textbook adoptions are due back in the UE Bookstore by March 30. When submitting or e-mailing them, please make sure you use Brooksie's e-mail address of bs267@evansville.edu. (Some old forms out there may still list ea74@evansville as the email address.) If you have questions please contact the UE Bookstore. Applications for the Margery Florence Kahn Scholarship for 2017-18 are now available. It was the desire of the donor, Margery Florence Kahn, that her scholarship be awarded to "dedicated and conscientious students who exhibit a true passion for their chosen fields of study, and who, in the opinion of the members of the University of Evansville faculty, are likely to bring the same enthusiasm into the performance of their jobs or the practice of the professions which they will pursue following graduation." All University of Evansville full-time undergraduate students who will be juniors or seniors in 2017-18 may apply. An essay of about 300 words must accompany the application, along with two to five faculty recommendation letters. Applications are available from the Office of Financial Aid, located in Room 116 in Olmsted Administration Hall. Completed applications and recommendation letters should be returned to the Office of Financial Aid by April 15. You may also request application materials by e-mailing financialaid@evansville.edu. Questions may be directed to the Office of Financial Aid via e-mail or by phone at 812-488-2364 or 800-424-8634. Family, friends, and loved ones of the late Marvin E. Hartig are pleased to announce the application process for the Dr. Marvin E. Hartig Memorial Scholarship. This scholarship is dedicated to the loving memory of Hartig, dean of Evansville College’s Evening College in 1967, and administrator for the Center for Advanced Study, director of the Evansville chapter of the American Institute of Banking (AIB), and the international student advisor. In 1974, Hartig was appointed dean of academic services. He retired in 1984 after serving his alma mater for 35 years and passed away in 2007. This scholarship will be awarded each year to a deserving sophomore student with demonstrated financial need as shown by the results of the Free Application for Federal Student Aid (FAFSA). Preference will be given to a student working while being enrolled as a full-time student. International students are encouraged to apply. Please include in your essay your particular financial need, since international students do not have FAFSA forms on file. What have you learned about yourself as a UE student? What do you do for fun when not studying or working? Name a special attribute or accomplishment that sets you apart. You have done a lot in your short life. In what areas do you think you can improve? What are your scholastic and career goals? How did you finance your freshman year and how will you finance your sophomore year? What have you learned about Dr. Hartig, how does he influence or inspire you, and how will you preserve his legacy as recipient of this scholarship? Please return all materials to the Office of Financial Aid by June 1. Decision will be announced by August 1. If you have questions, contact Trisha Hawkes, administrative assistant to the Office of Financial Aid, at financialaid@evansville.edu or 812-488-2364. Summer assistant applications due at 5:00 p.m. today! Summer assistant applications are due today at 5:00 p.m. to residence life. Don't forget to turn yours in! This is a reminder to all spring graduates. If you need a cap and gown and/or graduation announcements please stop by the UE Bookstore as soon as possible. This is ESPECIALLY required of all masters and doctoral graduates as a custom graduation gown and hood need to be ordered for you. It takes additional time for these items to arrive. If you have any questions please contact the UE Bookstore. Nominations for consideration of The Howard S. Rosenblatt Dean of Students Leadership Awards are due by this Friday, March 24. These awards will be presented at the 24th Annual Leadership Awards Reception scheduled for April 19 at 7:00 p.m. Invitations will be prepared by the Center for Student Engagement. Over 80 percent of UE students participate in at least one student organization or program. These organizations are successful because of the commitment of the student leaders and the advisors who give freely of their time and support. The recipients of these awards are selected based on their commitment to the University of Evansville as well as the development and success of their efforts within their chosen student organization. The deadline for nominations is March 20. You can download a nomination form or stop by Room 230 in the Ridgway University Center to pick up a nomination form from the Dean of Students Office. Return the completed nomination form and essay to the Dean of Students Office, located in Room 230 in the Ridgway University Center, or by e-mail to km306@evansville.edu. If you have any questions, please contact the Vice President for Student Affairs/Dean of Students office at 812-488-2500 or by e-mail via km306@evansville.edu. Thank you in advance for celebrating our student leaders’ achievements! Recently, two University of Evansville Board of Trustee members were inducted into the Evansville Vanderburgh School Corporation 2016 Hall of Fame. Dr. Rose M. Mays, class of 1967, and Lt. Gen. John B. Conaway, class of 1956, were two of 14 individuals inducted into the Class of 2016 Hall of Fame on March 15. Mays professor emerita, is retired from Indiana University Purdue University-Indianapolis (IUPUI) where she also served as an associate dean. She graduated from the University of Evansville with a Bachelor of Science degree in nursing. She earned her PhD from the University of Texas at Austin. Conaway, class of 1956.graduated from the University of Evansville with a Bachelor of Science degree in business administration. During his time at UE, he was a member of the Reserve Officer Training Corps (ROTC) program. He earned a masters degree in management and human relations from Webster College. In 1986, he was awarded an honorary doctor of laws from his alma mater. The EVSC Hall of Fame recognizes exceptional and exemplary individuals. The majority of those honored are EVSC graduates who have spent their lives improving public education. The EVSC Administration building houses the Hall of Fame display in downtown Evansville. Learn more about this year's inductees and the induction ceremony in this Evansville Courier & Press article. 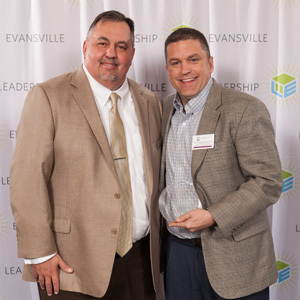 Celebration of Leadership recognizes individuals and groups who have positively impacted the Evansville community in the categories of the arts, community and neighborhood, education, environment, government and public services, and/or health and social service. The Upgrade Bikeshare Program won an award in the environment category. Upgrade Bike Share Program—Evansville-area Trails Coalition in partnership with city officials and representatives from numerous area organizations launched 70 cruiser bikes at seven stations across Evansville for members to use on demand. Anyone over the age of 18 can ride by purchasing a day pass or by enrolling in a monthly or annual membership. Locations include University of Evansville, North Main Street, West Franklin Street, Downtown YMCA, Downtown Pagoda, Haynie’s Corner Art District, and Deaconess Sports Park. The installation of this program marks the culmination of a collaborative effort between an impressive network of individuals committed to the progress of Evansville. Read more about this program. 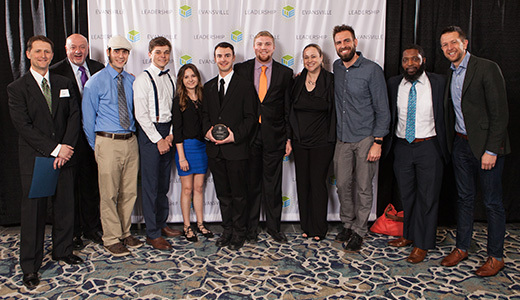 Congratulations to the Evansville Area Trails Coalition and the Changemaker students on their award for Upgrade Bikeshare! Physician Assistant Department Chair Michael Roscoe has been awarded the Susan Kelley Jordan Leader in Courage Award. This award was presented at the recent 22nd Annual Celebration of Leadership. Roscoe is pictured with his presenter, Dr. Steven Becker of IU School of Medicine. We are proud of you, Dr. Roscoe! Rob Shelby, assistant professor of sociology, was recently interviewed by the Evansville Courier & Press about national trends in church mergers. Part of his interview was featured in an article in the paper’s March 8 edition. Clark Kimberling, professor of mathematics, presented his recent research on "Beatty Sequences" and "Fractal Sequences, Fractal Trees, and Linear Recurrence Sequences" on March 8 and 9 to the Undergraduate Honours Seminar and the Faculty Colloquium at Dalhousie University, Halifax, Nova Scotia. Beatty sequences are named in honor of Canadian number-theorist Sam Beatty, and fractal trees were introduced in 2016 in the Online Encyclopedia of Integer Sequences.